Thank you for joining me as we count down to the next MFT release. We are five days away from the big day! All the new Stamps, Die-namics, and Stencils will be available on Tuesday, May 3 at 10:00 pm EST. Be sure to check out the MFT Blog to see all the new items being revealed today. Don't forget to leave a comment on the MFT Blog countdown posts, YOU could win one of the five $75.00 gift vouchers. My card today features the new Pretty Posies stamp set and Die-namics and the Because You stamp set and coordinating die. I stamped the flowers in Versamark ink and embossed them with White Embossing Powder. The flowers were then die-cut with the Pretty Posies Die-namics. The sentiment and the because die are both included in the new Because You stamp set. 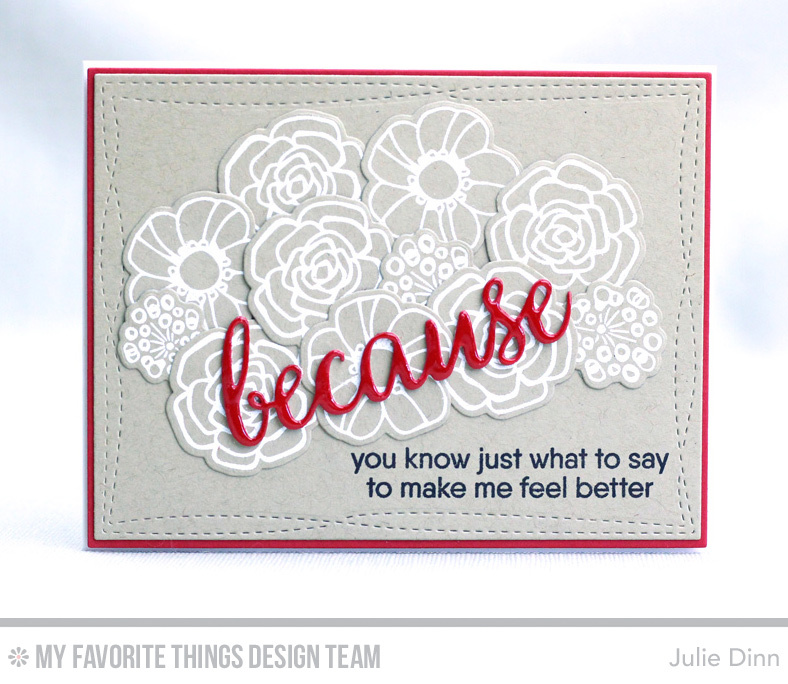 This stamp set is full of fabulous sentiments that all work with the because Die-namics. Love your take on this new release! Nice simple and powerful card! Really great card! Love the colours. They give it a modern edge and I can see this being fine for a man or a woman. Well done you!